“Ivan’s Childhood” is one of the most glorious film debuts in cine-history. Tarkovsky tells us the story of young Ivan – barely 12 years old – who works as a messenger for the Russian army on the Eastern front. The film gives us a few of the Tarkovsky hallmarks – austere, minimalist setting and a highly impressionistic look into the madness of war. “Ivan” is a visual delight and also one of his most accessible films for lay-audiences. The film opens with Ivan as a young boy embracing his mom in an idyllic family setting. Cut to Ivan, malnourished, dirty, alone hiding from the Nazis. Ivan is a messenger boy who sends messages across the front. He arrives at a Russian outpost where he’s to deliver his message to Captain Kholin. The soldier who greets him doesn’t believe Ivan’s tall tales of his involvement in the war. When Kholin arrives we realize Ivan is telling the truth. Like "Fellini’s 8 ½" the film flashes back to Ivan’s former youth. We see his mother and sister at their family home, playing hide and seek, eating luscious fruit etc. Tarkovsky’s shakes us back to reality with jarring cuts to the disparate war front. Intended or not, you will see some influence of “Ivan” on Steven Spielberg’s “Empire of the Sun”. Ivan may only be 12 but he has the worldly smarts of a war veteran. He is invisible to the age difference between his fellow soldiers and he expects to be treated like an adult. The war has made him a man, and although he dreams of his lost childhood, like Christian Bale’s character, we know, based on his real-life experiences he can never reclaim this. According to the extensive Criterion Collection liner notes, Tarkovsky was influenced – as many of the Soviet filmmakers during the post-Stalin ‘thaw’ period – by Mikael Kalatozov. In fact, it’s said he wanted Kalatozov’s DOP Sergei Urusevsky to shoot the film. He didn’t get him but instructed Vadim Yusov to make it look like Urusevsky shot it. It does, and it looks fantastic. Yusov gives the film a high contrast nourish feel. The interiors images are either harsh black or harsh white with strong shadows against the walls. The exteriors, are stark wartorn environments – endlessly flat background with sharp and jagged trees, and branches to fill the space. The seduction scene between Captain Kholin and Masha is fantastic for its subtle terrorizing of Masha’s character but it’s the visual design and choreography of the scene that is breathtaking. 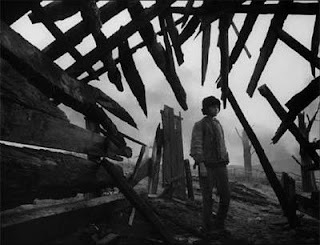 For a first film Tarkovsky shows astonishing confidence and cocky cinema-attitude. His deep focus long takes and sweeping camera moves are impressive. Tarkovsky would rely less on the gymnastics later in his career. But the impressionism would remain the same. It’s essential viewing for international cineastes. Enjoy.